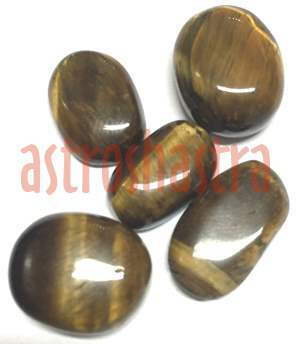 Tiger eye gemstone is a brown quartz silicon dioxide with lustrous yellow and brown parallel fibers. It has a hardness of 7 and belongs to the trigonal system. The yellow-gold colors are due to iron oxides. It has the property of chatoyancy, which means that it glimmers with a small ray of light on the surface, like the eyes of a cat. The largest deposits of this stone are in South Africa, Australia, Burma, India, and the United States. This stone comes in white grey, red or wooden colour. It is very popular in Africa and is available in plenty there. It looks like the "eye of a tiger". It keeps stomach ailments under a reasonable check. It also reduces tensions. It is derived from a mineral called crocidolite, which has been oxidized to golden brown from its original blue colour and has been completely replaced by quartz. It is considered to be the most popular chatoyant gem. It has a greenish cast with shades of brown, golden yellow, and reds. It balances emotions and brings clarity and focus to the mind. Opens the circulatory system to a more uniform and consistent flow. It has been said that it offers protection during travel. It helps us to obtain goals by taking direct action and by learning when to act or wait. It is especially good for clear thinking and helps one to see a problem objectively when confused or emotionally affected. Promotes balance and strength to get through difficult phases of life. It shows bands that resemble an eye, so it received its name due to this similarity. Roman soldiers wore it for protection in battle. Legend also says it is a psychic protector, great for business, and an aid to achieving clarity. From where it is found: South Africa, Australia, Burma, India and the United States. The best stones come from Griqualand West. It gives extra energies and good stamina. It also bestows the wearer with considerable initative and drive, without which one cannot easily make a mark in this complex world. It is recommended and lucky stone for those having their birth numbers as 2 or 7. It is good for childern suffering from insomnia or those not having proper concentration in studies. It is good for those, who have saturn in retrogression in their natal charts or have tensions or digestive problems. It is also good for financial gains. It is also good for those who may waiver to take decisions.